Free Estate Planning & Medicaid Seminars Seminole FL | DeLoach, Hofstra & Cavonis, P.A. 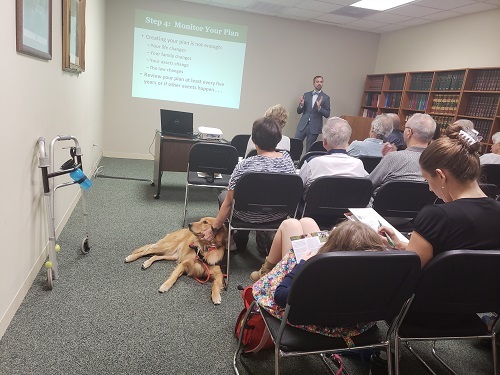 As an ongoing commitment to free education for the public, Estate Planning and Board Certified Elder Law attorney, Rep DeLoach, typically presents two seminars a month, one on Estate Planning and one on Medicaid Planning. Our educational seminars are free and open to the public, so we welcome all friends and family. All seminars are in the DeLoach, Hofstra & Cavonis, P.A. Law Library *unless otherwise noted. Seating is limited, so please RSVP to Ashleigh Fisichella at [email protected] or by filling out the form on the left-hand side of this page. Past attendees give this seminar high marks on clarity, information given, and questions answered. Pet Planning: What Happens to Your Pet When Something Happens to You? Sunday, May 19, 2:00 p.m. Seating is limited, so please RSVP to Ashleigh Fisichella at [email protected] or by filling out the form on the left-hand side of this page. "The seminar was extremely helpful, and Rep was very knowledgeable and knew the topic and explained it so we could understand, very well presented!" "We were very pleased to learn this seminar was being offered. It is something we had identified as a need. Rep did an excellent job in his presentation. The handouts were very helpful and the water appreciated. We look forward to meeting with Rep to discuss our estate planning." "Rep came highly recommended to me, he is MY Elder Law Attorney. I have a large level of satisfaction, trust, peace of mind working with Rep. I learned so much with this seminar and look forward to better helping my elder mom as well as myself through Rep. Great job Rep!" "Thank you, you are great and very caring about your clients!!" "Rep was an excellent speaker and "opened my eyes" as to how important a will is." "I feel much better and protected through the personal advocacy of our attorney, Rep DeLoach." "Thanks very much for setting aside regular time for the public to benefit from your expertise. This is much appreciated!" "So glad to be a client at this law firm, specifically with you, Rep!" "I have heard many elder law presentations. Your knowledge, delivery and quality of content were exceptional! I learned many new things. Thanks!"